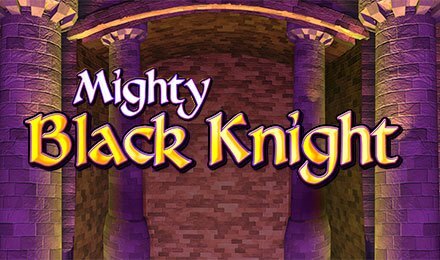 Mighty Black Knight slot takes place in a medieval setting, where you get to spin the 5 reels and 50 paylines of this game. In this dimly lit castle, a lot goes on, so launch the game on your mobile, desktop or tablet at Vegas Spins Casino and enjoy! On the reels of this slot game, symbols like: Spades, Hearts, Diamonds, Clubs, Maps, Ring, Orbs, Crowns, Kings and Queens combine on active paylines to trigger wins! On the Bet Field, set your stake using the plus or minus buttons before you begin your gameplay! Click on Spin to start your gameplay! Autoplay is available, and here you can set a few auto spins to play hands free. Coin Values: Stake values range from £0.10 to £250.00. The wild of Mighty Black Knight slot is the Black Knight himself, and replaces all other symbols bar the scatter symbol. The scatter symbol takes form of the Mighty Black Knight Logo, which triggers the Free Spins Feature. Line up 3, 4 or 5 scatter symbols anywhere on the reels and trigger this feature to receive 8, 12, or 20 free spins respectively. The feature takes place on an alternate set of reels where landing more scatters during the play of the feature grants extra free spins. When Expanding Wilds appear on the reels, the Mighty Reels Feature becomes active. The upper reels unlock and paylines are doubled to 100 paylines. The wild expands to fill up the whole reel and increases chances of triggering a win. Launch this feature by toggling the BB button. This option consists of five linked spins that are set to play with extra features. Big bets can be made at values of £20, £30 and £50, where on each of the bets, different features come into place.